Stewart Filmscreen, manufacturer of projection screens and specialty optical coatings, will showcase 4K+ screen materials at Integrated Systems Europe 2015. Stewart will demonstrate GrayHawk RS G4 gray screen material, CrystalView rigid rear-projection screen, and the CIMA by Stewart Filmscreen line alongside several other new products designed to address existing and emerging markets that will be announced in closer proximity to the show. Stewart Filmscreen Europe will premiere the latest in front-projection gray screen technology, GrayHawk RS G4, at ISE. There, attendees will see the new material, which was designed with an improved optical coating to enhance the performance characteristics of today’s high-output ultra-bright 4K Ultra HD and HD projectors. With improvements to uniformity, black levels, and off-axis viewing, G4 produces reference-quality image fidelity. The company is applying those same performance standards to Cima by Stewart Filmscreen, a value-oriented line designed and manufactured in the USA by Stewart’s award-winning team. The Cima line targets a broader, less ‘needs specific’ audience. Cima’s efficient design and features address the needs of ever-converging residential/commercial projection applications without giving anything up in performance, quality, or durability. By making Cima available only in a limited selection of high-quality screen materials at standard sizes, Stewart ensures high performance at the very best value. Neve (white) CIMA screens are perfect for rooms with greater control over lighting, while Tiburon G2 (gray) Cima screens are ideal for spaces with more ambient light. 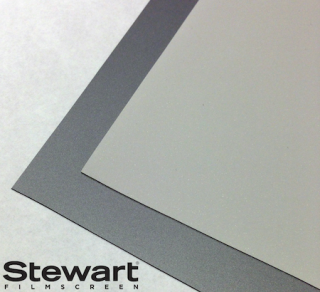 Cima screens are also 4K+ ready, as are all Stewart Filmscreen materials. Finally, Stewart Filmscreen will be demonstrating CrystalView, a rigid rear-projection screen based on the combination of a custom neutral density formulation and Stewart’s diffusion technologies. CrystalView is versatile, adding value and intrigue when furnished with laminated safety glass, which allows the screen to be mounted closer to floors or doors than ordinary glass and expands its versatility.